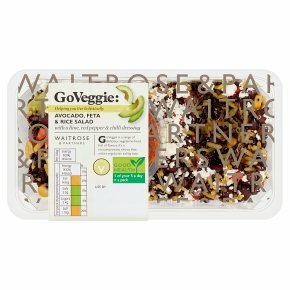 INGREDIENTS: Black rice (water, black rice), turmeric rice (water, rice, turmeric), black turtle beans, avocado (8%), red pepper, black quinoa (water, black quinoa), sweetcorn, feta cheese (milk) (4%), tomato, lime juice, sunflower oil, pea shoots, mint, tomato concentrate, coriander, salt, water, olive oil, black pepper, ancho chilli powder, cumin, smoked paprika, lemon juice, garlic, sugar, firming agent (calcium chloride). For allergens see ingredients in bold. May contain: peanuts, nuts and sesame.